It's been said that Toronto is a city of neighbourhoods, and within every neighbourhood are gems that have often remained "locals only" knowledge. Now that we have the internet, we're able to explore far outside the usual downtown haunts for new and exciting food, and stumble across some of those locales that we may not have ever even considered before. Scarborough itself is no stranger to a variety of highly-praised restaurants but it's mostly flown under the radar in terms of the west end-oriented, trendy Toronto foodie scene. 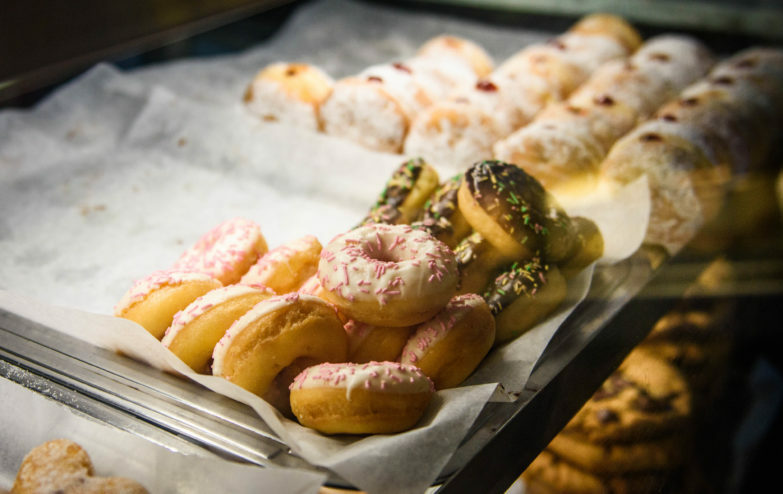 Lamanna's Bakery is one of such places, nestled in a strip mall off the 401, on the far east side of the city, that's recently beginning to make a splash on Instagram as the place to go for, amongst other things, pizza. Big huge pizzas! 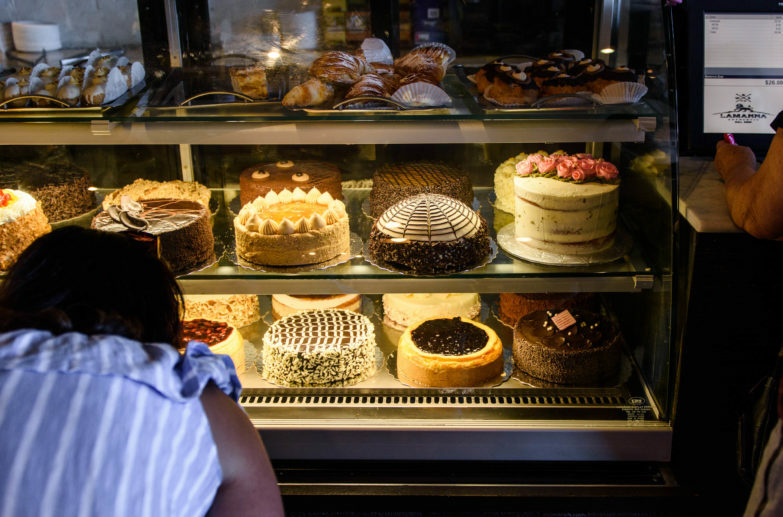 As the name suggests, it's a bakery first with a large selection of pastries, cakes, and biscuits, but also gelato, sandwiches, coffee, hot table meals, and deli meats and cheese. It's truly an example of an Italian family-owned and operated business. 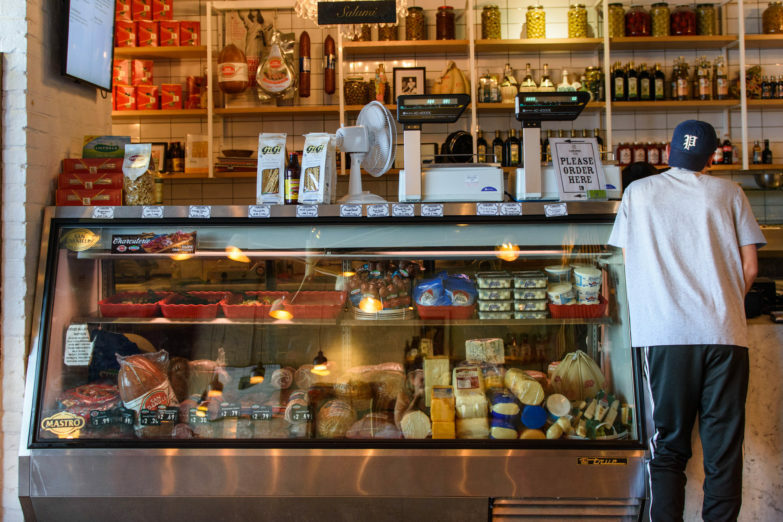 Started by husband and wife, Peter and Rosa Lamanna, it also employs their children to keep the whole thing seamlessly offering pasta, pizza, deli, and all sorts of Italian fare that is actually fairly difficult to find in such quality in Scarborough. If you're looking for a sit-down, table-service Italian experience, you're in the wrong spot as the space is large, and more similar to various market-style eateries such as the chain-franchise Marche. There are various stations such as Salumi, Dolci, and Espresso. Each section has it's own ordering and till, so you don't need to queue up with the people ordering pizza if you only want a coffee. But that doesn't mean there isn't any seating. All along the large, bright windows are booths and tables, as well as stools for the cafe side. 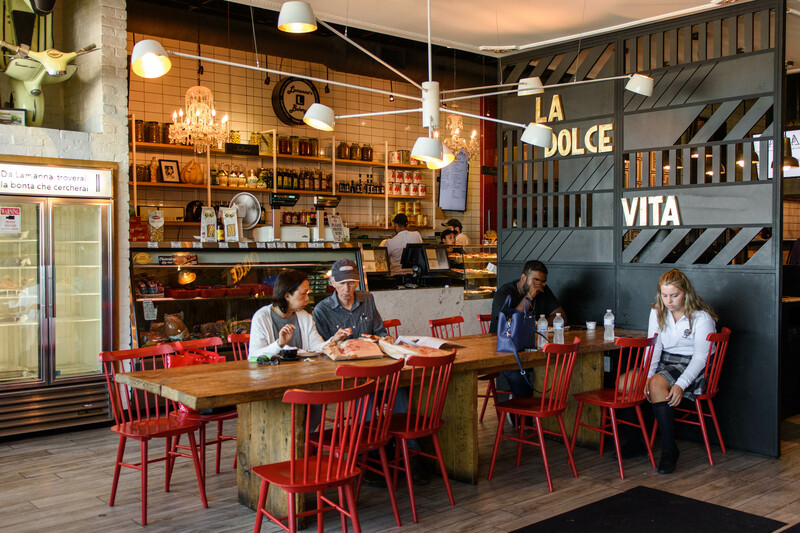 In the centre, and the first thing you see upon entering is a large, wooden communal table with a bold "La Dolce Vita" sign behind it. Unless you're visiting at a busy lunch hour, you're likely to find somewhere to sit, although it may not be the ideal spot. The decor is vintage-style, with an Italian twist, including an actual Vespa hanging from a wall, as well as many old photos, and a gentle, pastoral colour palette. It's a well-lit space with ample natural light, even when packed full of customers and although it can seem loud and busy, it's never the sort of overwhelming noise that is more reminiscent of boisterous school cafeterias. It's an enjoyable sort of buzz. The menu here is wide-ranging and ever-changing, and sometimes a little difficult to figure out how much things cost. (Bakery section, I'm looking at you!) As stated previously, you've got multiple stations to choose from including sandwiches, pizza, pasta dishes, baked goods, and gelato. On offer for the pizzas, are a variety from the usual suspects of pepperoni or margherita, to stranger fare such as pasta on pizza. 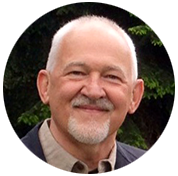 Generally speaking, you'll have a range of respectably sized, moderately reasonable choices to pick up. Since it is a bakery, the varieties can change daily. Don't walk in expecting to always see their Insta-famous grilled cheese pizza or french fry pizza in the window. Both days I stopped by, they only had the regular choices such as Sicilian, diavola, prosciutto and goat cheese, meat lovers, vegetarian, chicken alfredo, etc. They're not reinventing the wheel on an hourly basis, but if you're lucky you may end up here on one of their more creative days when they have such toppings as mini-grilled cheese sandwiches, bruschetta, mini-pizza, tortelini, bacon and pancakes, potato chips, or even Nutella. A single slice will cost $4.50. 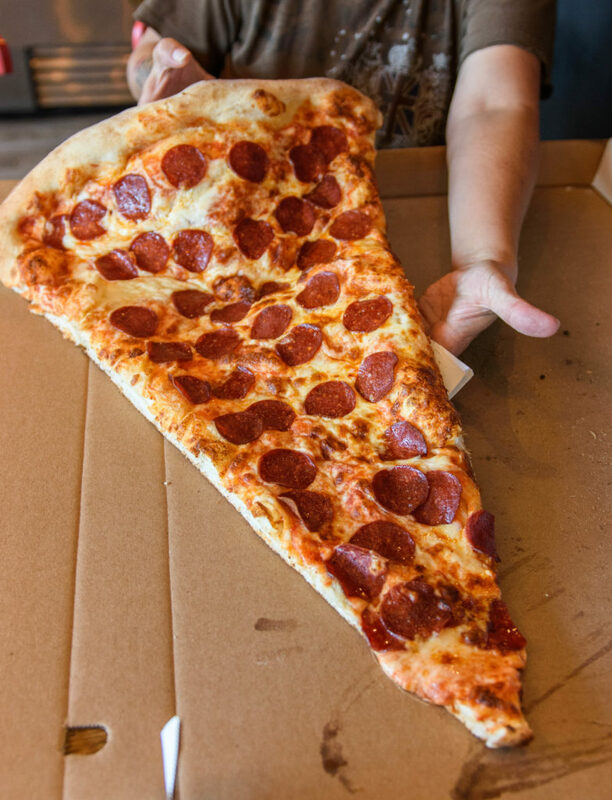 The giant slice, which is 5 times the size and suitable for 2-4 people (although it's a bit awkward to share due to being one massive hunk of pizza that requires tearing with your bare hands into edible pieces), comes in at a fairly good $21.99. But that is just pepperoni. They have select other toppings available for a little extra. Also available to order at the pizza counter are sandwiches, which are available on a bun. The choices include veal, chicken, sausage, 2 meatballs, 3 meatballs, or porchetta ranging in price from $5.99 to $7.99. Some of these are also available as plated dishes, for around the same price. Grilled sandwich options include steak or chicken at just under $8 for either. Also included are the usual sandwich toppings such as mushrooms, onions, hot peppers and extra cheese for a minimum charge. There's another sandwich menu that may be missed unless you're looking for it, almost hidden above the Salumi counter. It includes Ham or Roast Beef & Cheese of your choice, for $6.49. Other possibilities are Italian Deli Blowout, Prosciutto & Boccancini, The Montrealer, Turkey & Swiss, or Muffeletta which is primarily a New Orleans-Sicilian import although we didn't order one, so I can't speak to its authenticity. Again, the price point is very reasonable between $6.99 and $8.99. Custom sandwiches, both regular and deluxe for the same price range. The Rosticceria includes plated dishes from disposable tinfoil chaffing dishes. Options for hot food include both meat and vegetarian lasagna, penne, spaghetti with or without meatballs, and arancini. The latter is cheapest at $3.99 but most dishes hover around the $7-8 mark. Sides are the usual potatoes, rice, hot peppers, or mushrooms available as a full or side size. The Dolci section encompasses a large range of desserts from cakes, to doughnuts, to pastries, to cookies, to gelato. 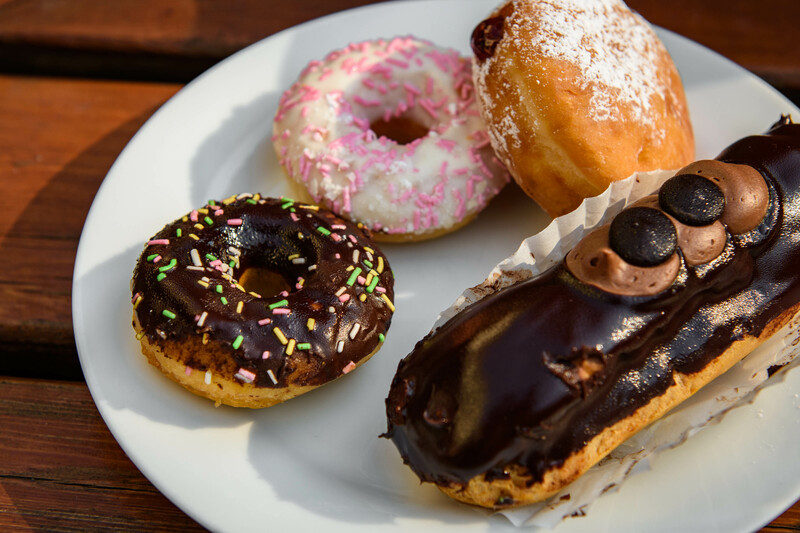 There are no prices on any of the pastry section but it seems that most range from $3 to $6 a piece. Cakes can be custom ordered or bought as-is in many, many flavours and styles. 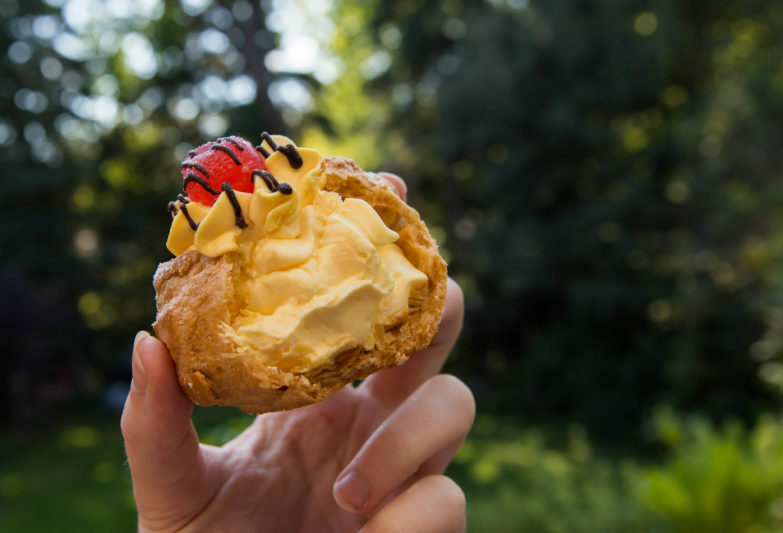 As it's Italian, you'll find the expected cannoli, sfogliatelle, napolean, and custard puffs. Many of these have both large and small sizes. 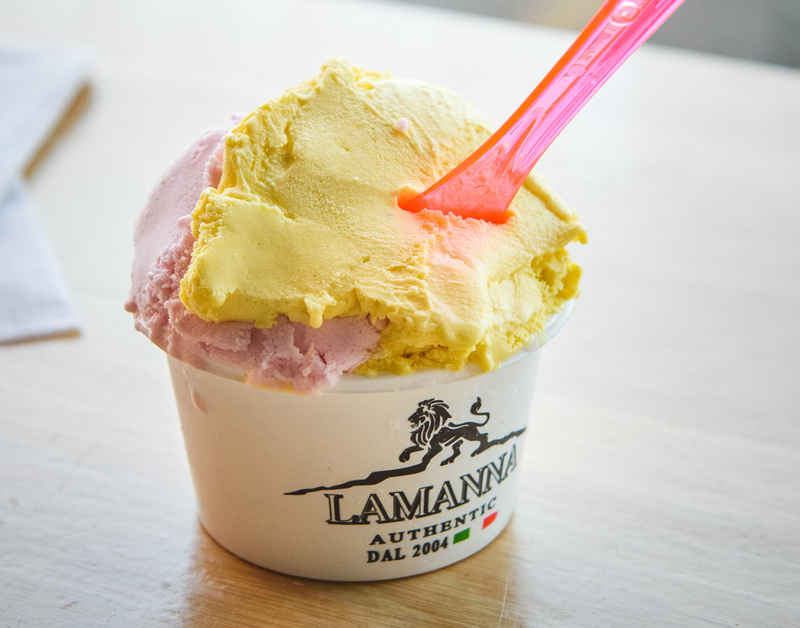 The gelato at Lamanna's changes often with some flavours being somewhat experimental. Some creative past options have included Peroni (beer) and Cinnamon Toast Crunch flavours. There will always be old standby flavours such as mango, chocolate, and strawberry. Sadly there was no stracciatella on our visit, which is my personal go to.Some of the flavours available were Cherry Cheesecake, Pumpkin, Birthday Cake, Banana, Pistachio, Nutella, Dark Chocolate and Pecan Pie. 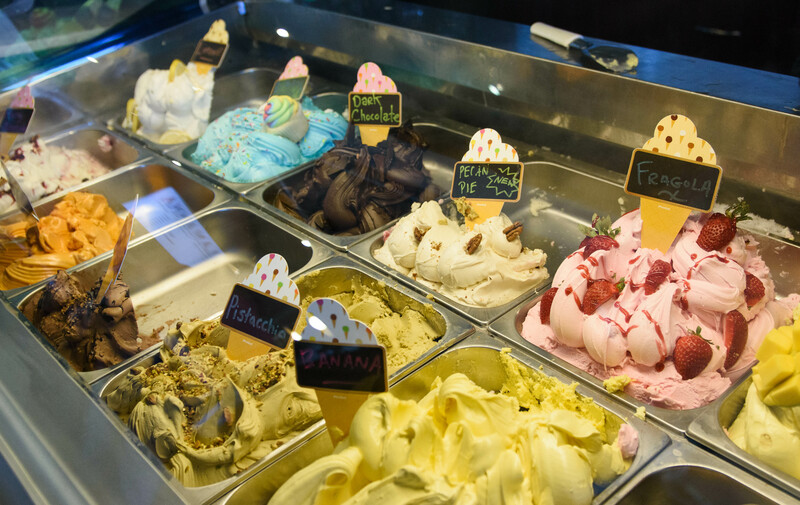 The gelato comes in 3 sizes for $3.95, $4.95, and $5.95 and even the small comes with your choice of two flavours, packed rightly in the cup. Even a medium is way more than enough. Finally, the Espresso section is where the java hounds go for their fix. 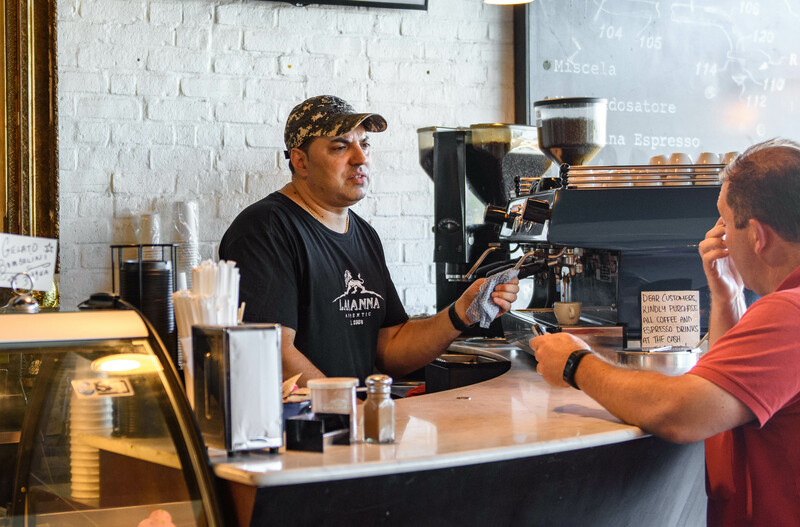 As the name suggests, Lamanna's has quite a few espresso offerings including affogato which is espresso topped with gelato. That is $3.50. All other options are $1.75 for a single or $2.45 for a double, except the espresso machiatto which is 25 cents more. 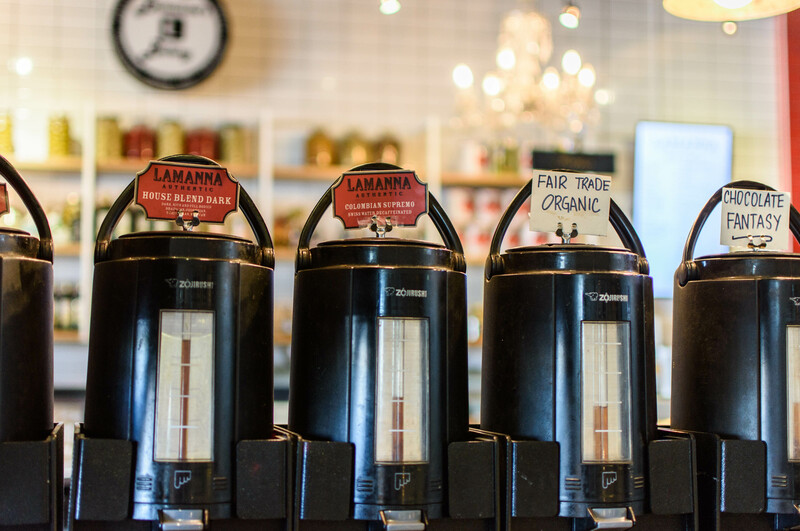 The coffee bar also includes filtered coffee, lattes, and cappuccinos, as well as specialty teas and a few alternatives such as the Red Eye which is espresso with filtered coffee, London Fog, Caffe Misto, or hot chocolate. Medium size lattes and filtered coffees are around $3, and large go no higher than $4.25. As this is not a typical restaurant, it skews the usual appetizer and entree trend. We came for the giant slice so that was the goal. Luckily on our second visit, there was only a very small queue and we quickly ordered the giant slice. As the slices are made to order, I was told it would be a 30 minute wait which seemed fairly reasonable but I wouldn't order this on a lunch break or if you have limited time. I'd assume that during busy hours, it may be an even longer wait. We took the time to scope out everything else they had to choose from but didn't really see anything from the hot table that looked particularly appealing. Most of the dishes looked as if they had been sitting there for a while, and the lack of proper chaffing dishes made them seem doubly unappetizing. Perhaps they are tasty, but knowing that we had a huge pizza coming, there wasn't a lot of temptation. It appeared that most people visiting the rosticceria were getting the aracini. Almost at 30 minutes to the second, my name was called for the pizza. To call the giant slice anything else would truly be an understatement. It was at least 2 feet long, tip to crust. 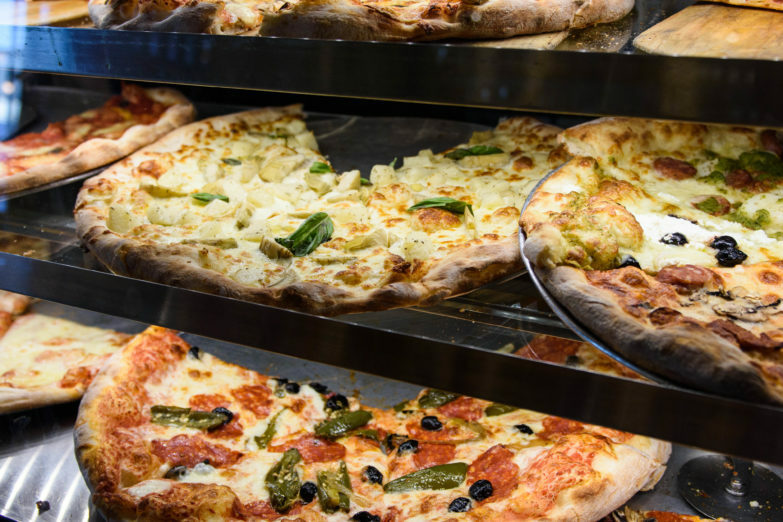 It's easy to forget what good pizza tastes like when you're accustomed to take away from Pizza Pizza or various small, cheap pizza parlours after a Saturday night on the town. The first thing, other than the size, that we noticed was how fresh it was. Normally, I order easy cheese and had forgotten to do so this time around but it wasn't necessary since this pizza had the perfect amount of cheese and clearly it was higher quality mozzarella than other pizza shops as it was missing that thick orange grease that is so frequently seen on bad pizza. The pepperoni were thin and dark, well-cooked and despite it's sheer size, the entire slice was evenly cooked with no under-cooked doughy sections that one may expect in such a large pie. The bread was the perfect thickness to accommodate the amount of sauce and toppings, with a nice crusty crunch to the base. The sauce was the perfect balance of sweet and tart that a solid tomato sauce has, and although they have tins of tomato pastes and sauces on the walls, it didn't actually taste canned which says a lot to the way they make their pizzas if it's not immediately noticeable. I have heard it's homemade sauce which explains why it's so tasty. And it was piping hot! We could barely pick it up as it was fresh out of the oven, no sitting around under warming lamps for this pizza. The taste of a truly fresh slice, not one that has been reheated, is what makes the giant slice really worth it. Although I'm sure their premade slices are tasty, there is nothing equivalent to a fresh pizza, even if they reheat slices in the same oven. The giant slice comes with its own box because it's clear that two people are not going to finish this monster in one sitting unless they're starving or have stomachs the size of a small car. We had ample leftovers for that evening and the next day. With half of the shop taken up by various sweet things, it would have been impossible to leave without at least sampling the raison d'etre of this bakery. First up, the tempting colours of the gelato case called to us and I spent a great deal of time agonizing over which to order. Obviously, my eye was drawn first to the bright blue Birthday Cake but when considering what to pair it with, I wasn't sure it would really compliment any other flavours so I played it fairly safe with the traditional strawberry and banana coupling. If I was to go back, I think the pecan pie and Nutella may find themselves on my lips as well. My companion grabbed a large, whcih allows for 3 flavours and chose mango, banana, and dark chocolate. Now, as safe a bet as mine was, it was also delicious. Although the gelato appeared a bit too hard and dry when it was being scooped, once it was in my dish it was smooth and flavourful. The standout star was banana which overwhelmed the strawberry by a mile. Even with my medium size cup, I found myself unable to finish the whole thing and I'm usually the first one to lick my dessert dish clean no matter how big the meal. This gelato however was just very satisfying. It isn't the best gelato I've had, as when in Europe, they're much better at it, but it really did hit the spot after that pizza. The mango was okay, nothing special to them but I found it rather refreshing. My friend really enjoyed the banana and the dark chocolate was divine by both our standards. It was rich, smooth, and tasted exactly as it looks it would. Like melted dark chocolate dripped over mango and banana. 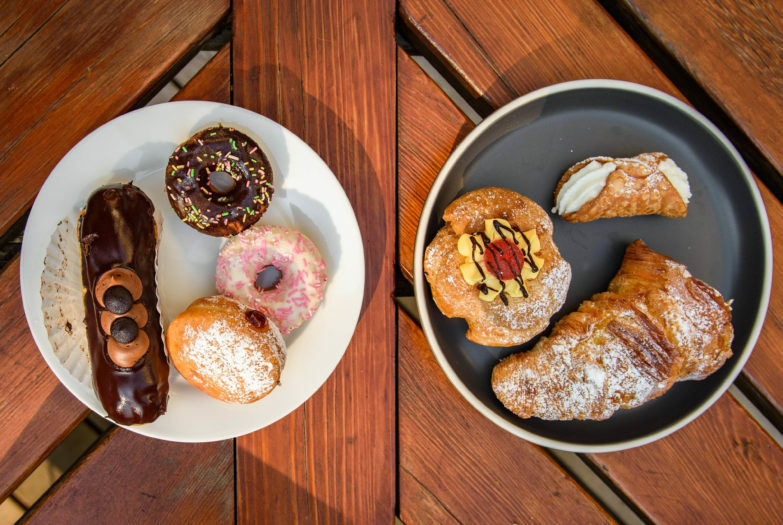 Deciding to grab a few bites from the pastry section, we settled on a selection of cannoli, custard puffs, doughnuts, chocolate eclairs, and sfogliatelle. As a huge fan of anything creamy and sweet, I found everything more tasty than I expected! While the doughnuts were a bit on the dry side, even with the cream pumped inside them, the sfogliatelle was bursting with smooth and excellently balanced custard creme. I'd never actually had a "lobster tail" before and quickly fell in love. The custard bun was slightly sweeter though definitely not lacking in filling, and the pastry in both was crisp and fresh, not a soggy patch anywhere which was wonderful considering it was mid-afternoon and likely these had been sitting on the shelf all day. My friend really enjoyed the cannoli which has a thick filling and crunchy, if slightly too thick for me, shell. As previously mentioned, the drinks are primarily cafe offerings. We decided to test out their coffee skills with the Superbar Espresso which claims "bold, nutty notes and a dark chocolate finish". And also a cappuccino. While coffee and pizza may not be everyone's cup of tea so to speak, it works for me. Sadly, the espresso wasn't good. It was bitter and burnt with none of the notes mentioned in its description. It tasted no different than cheap Starbucks espresso shots. I was forced to add huge helpings of sugar just to make it palatable and I am accustomed to espresso and black coffee. A good coffee bean with a good roaster and a skillful barista can make a delicious coffee with no need for any additives but this was just sour and bitter. I couldn't even finish that tiny cup. Next up was the cappuccino. Again, the coffee itself was lacklustre and didn't really taste any different than a chain coffeeshop. And no biscuit or anything, which I have become accustomed to in European cafes. This is obviously not a necessity but you'd think a bakery might include a small biscuit of some kind to pair with it. 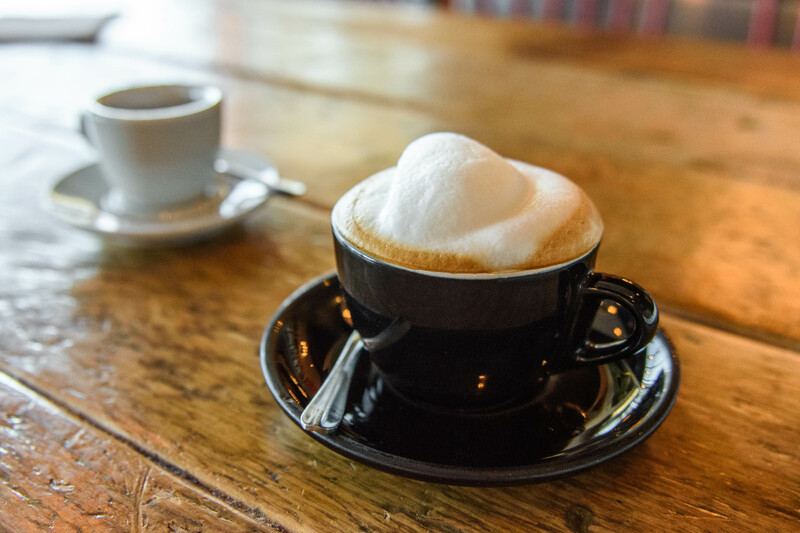 The great part of the cappuccino however was the foam. Exceptionally well formed, thick foam that was a pleasure to have on top. I really appreciated the skill making it. It's just too bad the coffee itself is subpar. While the food is good, well-made, and served nice and hot, the service is where this place falters. Not only is it confusing with various lines winding their ways through crowds, but it's slow when they're busy. The first time I attempted to visit was at lunch hour and the whole place was packed! Long lines stretched around the store. And after standing in line for about 10 minutes and not moving an inch, I gave up on getting pizza that day. (I did have a chance to read all the take-home options they sell, like a small vegetable lasagna for $50!) The bakery/coffee/gelato lines were not faring any better. Not to mention, there wasn't a free seat to be seen. I am not a social psychologist or pedestrian dynamics expert, but I wonder if there is a better system they could put in place to alleviate the waiting and confusion. It's also not entirely clear where to order what. The second visit was more successful and the young women behind the pizza cash counter were friendly, happy, and able to answer my questions. There was no problem ordering the giant slice and they were very prompt in calling it out for me when ready. On the otherside of the shop, everybody appeared friendly enough, although service seemed a little slow, except for the young woman who made my coffee who was very quick. The man who was usually making coffee seemed unfriendly and only interested in talking with who I can assume are regulars, a group of men who seem to know each other and just hang out sipping espressos. There was one strange aspect of the place beyond the confusing queue set up. It offers seating but I did not see anybody clearing tables after people leave (although clearly somebody does at some point), and perhaps it's for the reason that they don't offer proper cutlery? It is absolutely impossible to cut the giant pizza slice with the flimsy plastic knives on offer so if you're sharing, hopefully you don't mind your friends' paws all over your food. 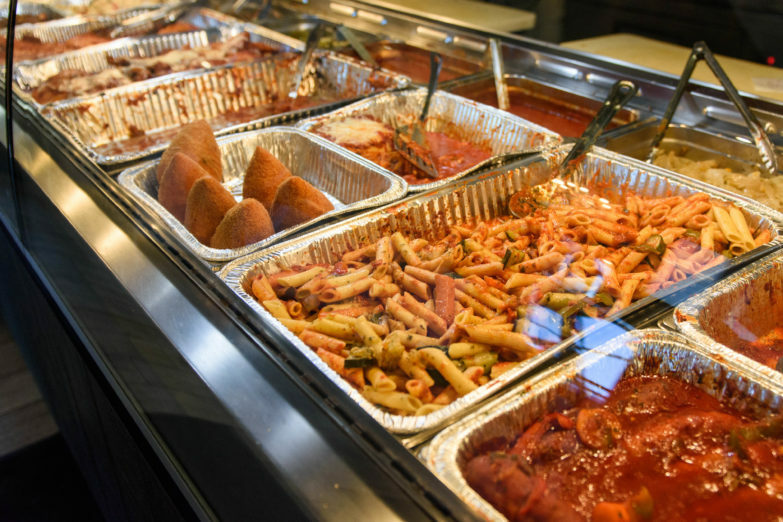 Lamanna's would benefit from non-disposable silverware and proper dishes for people eating in. The cafe is the only area that appears to serve coffees in actual mugs. Overall, it was manageable and all of the female staff were courteous and knowledgeable but I'm not sure I'd want to come back during peak hours. Despite the confusion and crowds of the first visit, it was a fairly positive experience and we left feeling both full and satisfied. We had to take home some of the pizza and the pastries but I was pretty impressed with all the good and variable tastes offered up. And my friend claims they have the best cannoli she's had in Toronto thus far, so I'm sure I'll be back to pick up some of those at the very least. The best part is that there is so much to choose from that I could come back many more times and still not have tried close to everything on the menus. My curiosity is piqued with the sandwiches and that is going to be my next order on a return visit, and of course, I'd have to check out what new and creative gelato flavours they're going to have. There are better places to stop in for a coffee but their sfogliatelle and pizza will always call to me if I have a craving for either!